It’s time to set your DVR’s and reminders. 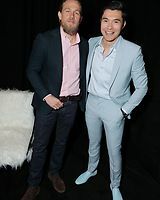 Charlie is set to appear on The Late Late Show with James Corden along with the new AMC late night talk show Talking with Chris Hardwick. You can find the details and dates below! I’ll update this post once the date for Talking with Chris Hardwick is announced. AMC has announced the initial lineup for the forthcoming season of Talking With Chris Hardwick. 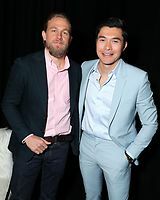 The nine guests include Connie Britton, Michelle Monaghan, Neil deGrasse Tyson, Charlie Hunnam, Justin Theroux, Bryan Cranston, Elijah Wood, Damon Lindelof and the cast of Silicon Valley. There is no current information on the airing order, and additional guests will be announced soon. 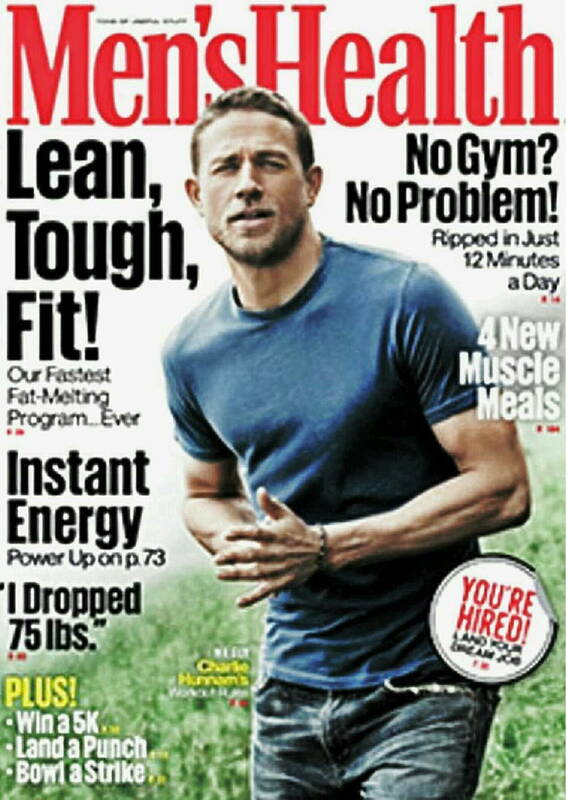 Charlie to Cover Men’s Health Magazine for April Issue! Check out the sneak peek of his cover below which supposedly hits newsstands April 20th. Fingers crossed for a better quality preview to be posted soon! The official convention of the National Association of Theatre Owners (NATO) will honour the British star on March 30. 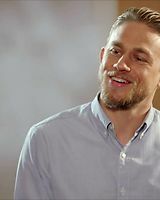 Charlie Hunnam will receive the Male Star Of The Year Award during the annual Las Vegas CinemaCon event. 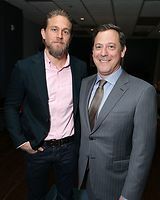 The actor will next be seen in The Lost City Of Z, which Amazon Studios and Bleecker Street releases on April 14, followed by King Arthur: Legend Of The Sword, which Warner Bros opens in North America on May 12. 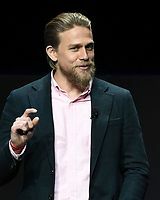 “Having captured the attention of audiences around the world with his standout performances on the small screen in Sons Of Anarchy as well as on the big screen in such films as Children Of Men and Cold Mountain,’2017 is sure to be Charlie Hunnam’s year with his starring turns in King Arthur: Legend Of The Sword, and Lost City Of Z,” said CinemaCon managing director Mitch Neuhauser. CinemaCon is scheduled to run from March 27-30. 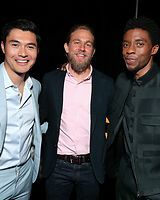 We’ve all been wondering why Charlie was in London recently, and as it turns out while also doing what I assume is some early promotion for the film it appears that Charlie will also be attending the UK Premiere of the Lost City of Z. 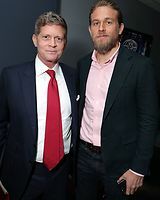 The stars listed to attend include Charlie, Sienna Miller, and Robert Pattinson. The premiere itself will take place on Thursday, February 16th at The British Museum hosted by Harper’s Bazaar in celebration of their ‘Best of British’ issue. I’ve added HD captures of Charlie from his brief appearance on the AMC’s Geeking Out which aired last month following the San Diego Comic-Con. You heard right, people! Be sure to tune into the special San Diego Comic-Con episode of AMC’s new show Geeking Out tomorrow night at 10pm! Warner Bros. Pictures will once again commandeer the convention when the Studio’s biggest stars, DC’s best Super Heroes and “worst” Super-Villains, fantastic beasts great and small and more head to this year’s Comic-Con International: San Diego. On Saturday, July 23, beginning at 11:30 a.m., Warner Bros. will showcase several of its most-anticipated upcoming feature releases in its Hall H presentation, headed up by master of ceremonies Conan O’Brien. Leading the way for this all-star panel will be Suicide Squad stars Will Smith, Jared Leto, Margot Robbie, Joel Kinnaman, Viola Davis, Jai Courtney, Jay Hernandez, Adewale Akinnuoye-Agbaje, Scott Eastwood, Cara Delevingne, Adam Beach and Karen Fukuhara, along with writer/director David Ayer. The panel will also feature Wonder Woman stars Gal Gadot, Chris Pine, Connie Nielsen and director Patty Jenkins. 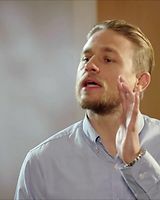 Director Chris McKay and star Will Arnett will also be present to promote The LEGO Batman Movie, along with Charlie Hunnam, who plays the title role in Guy Ritchie’s epic action movie King Arthur: Legend of the Sword, from Warner Bros. and Village Roadshow Pictures. Stars Tom Hiddleston, Brie Larson, John Goodman, Corey Hawkins and Jason Mitchell and director Jordan Vogt-Roberts of Warner Bros.’ and Legendary Pictures’ Kong: Skull Island will also be present, along with director David Yates and stars Eddie Redmayne, Katherine Waterston, Dan Fogler, Alison Sudol, Ezra Miller and Colin Farrell from Fantastic Beasts and Where to Find Them. There will also be several convention floor activities on Saturday, July 23. 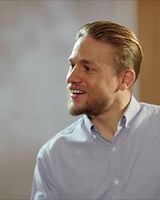 In the Warner Bros. Booth, there will be a Fantastic Beasts and Where to Find Them Wand Station and talent signing, The LEGO Batman Movie Selfie Booth and an autograph signing with King Arthur: Legend of the Sword star Charlie Hunnam.